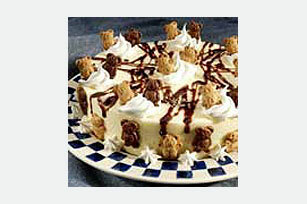 Ice cream frozen in a springform pan is unmolded and decorated with bear-shaped grahams, fudge sauce and whipped topping for a fun kid’s dessert. Pack ice cream firmly into 8- or 9-inch springform pan. Freeze 2 hours or until firm. Unmold ice cream layer onto serving plate just before serving. Press graham snacks into side of ice cream layer; top with whipped topping and chocolate topping. Garnish with additional graham snacks, if desired. Store leftover dessert in freezer. This recipe is a kid's favorite. At 16 servings, it is just the right size to serve at a kid's party. Microwave ice cream on MEDIUM-LOW (30%) 1 minute or until slightly softened.